As much as we’ve seen her on reality TV or heard of her music, never could we imagine how great her fashion collection would be so flirtatious to the naked eye. Jessica Simpson’s collection has grown in the past few years or so, since she and her mother have decided to put their taste on the line. With an interview with Sarah Bronson on the Yahoo’s Shine: The Thread Jessica stated that we can hate her, find her to be annoying but we will love how we look in her shoes, love how her jeans fit, and love her bags. She has the ultimate confidence in her collection and fashion sense and with all the hot rage and excitement over her newest fall collection who could blame her. With all the reviews that have been noted her style is something to add to your closet. 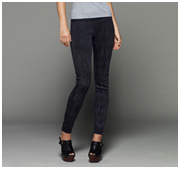 From her jeans, shoes, even to her intimate collection we can the comfort in her items and the keen sense of style. Her collections not only includes these new fitted and comfortable jeans but she also has intimate wear which is cute and can be worn all the time, a bag collection that any woman can support and even accessories such as scarves and jewelry. With all these different items it’s hard to walk away from her collection without just one thing in your mind. Jessica Simpson makes her style look undeniably gorgeous on the racks. We get lured in by the talk of her heels be so comfortable and having such unique style and we start to see who Jessica Simpson truly is through her style. With her new jean collection we can see a different assortment with faded jeans, gray jeans, denim, skinny jeans and jeggings. With all the height around fall fashion and her Jeanius Jeans, you can also look forward to her boots and booties for this fall. Boots and booties can be a woman’s best friend during this season and with Jessica Simpson’s collection not only will you find a nice suitable pair but you’ll also feel comfortable. You won’t feel that annoying ache after a few hours on your feet. Very seldom can you find heels that don’t bother your feet. And if we don’t find it we just chalk it up to “the price of beauty” or “beauty is pain”. But with her comfy and fashionable collection you don’t have to worry about the pain it’s amazing. She centers her style around not only beauty and what’s new and hot fashion but also comfort and allowing women of all ages to come, shop and feed they’re closets. Many of her scarves just like those on womenclothingtoday.com are very sensual and comfy; her jewelry allows you to see a different side of her; edgy while some is very classical for dinner. With her collection you are sure to find what you want for the work place, school, dinner parties, night out on the town, and even leisure time around the house. Enjoy what celebs like Jessica Simpons wear and feel good all the time just like you would when you’re wrapped all over in intoxicating silk. 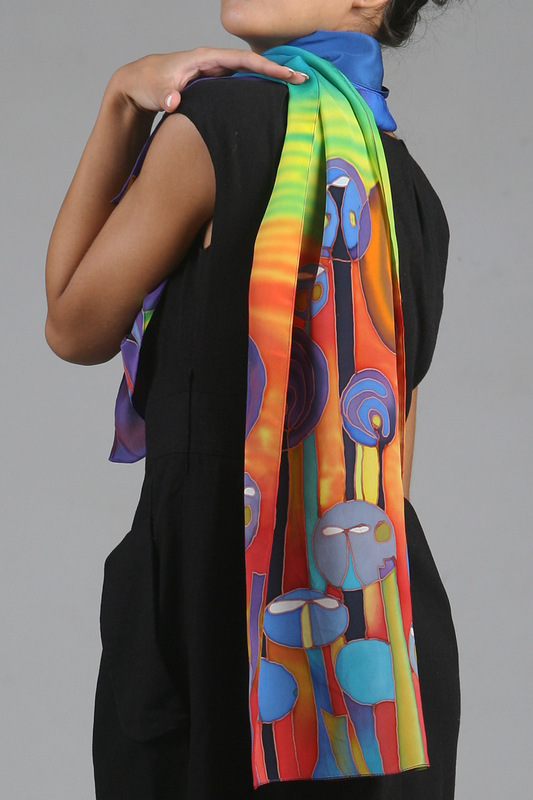 So beautiful and colorful that you will definitely light up the room with this stunning hand painted silk scarf. This is the style you have been looking for. Wear to the office or out on a date and you will attract all the attention. 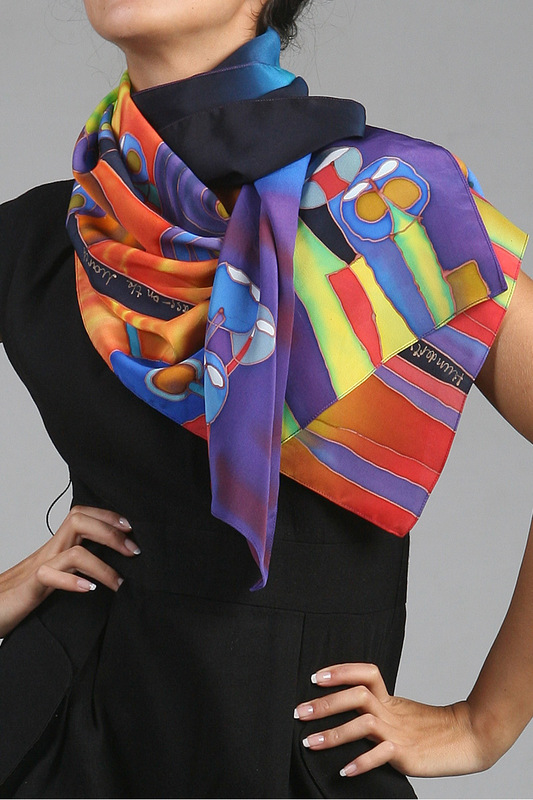 • We are committed to producing cutting edge design and the highest quality handcrafted silk scarves and shawls! Sometimes staying warm and looking cute can be challenging at times. It’s not the best way to look at all the time either but sometime we get tired of seeing girls wear boots with shorts and a scarf in the pouring rain. It’s not the best look for the rain but some of us girls do just because to us it’s not cute. We want to be warm and cute and with these fun and innovative ways you can look gorgeous without looking like a big ball of cloth ready for the worst weather. One of the things to keep in mind about today’s fashion is that even though some things may start off expensive they can really be great fabric and great quality that can last for a long time but that doesn’t mean that you have to always look for the most expensive products. Like Victoria Secret who have a plethora of different prices you can find great quality coats and robes. Dillard’s have great quality coats as well. Old Navy and Macy’s who have great colorful sweaters at decent and affordable prices especially at this time of year. And even nice sleek silk scarves at womenclothingtoday.com But it sometimes can be difficult finding what styles or looks you should go for when shopping or adding to your closet. 1. A Must Have: A Robe. Victoria Secrets terry cloth robes are beyond luxurious and worth every penny. When you step out of the shower for some reason it seems a lot colder on during the fall and winter season but robes can be worn around the house as well as after the shower. With these robes you can get dried off and it won’t get heavy or soaked. 2. Scarves! You can never have too many of these because they can be used during every single season. 3. Boots! Jessica Simpson’s Shoe collection is very admirable and the shoes are very comfortable. Get a neutral color: brown, black or even grey and you can wear these shoes even if it has a heel. Her shoes are stylish for the work place as well as school. Also see Madden’s boots. 4. Sweater dresses at Old Navy. A lot sweater dresses at old navy or at a great price providing great warmth with a smooth feel. 5. Slippers. Don’t you just hate when you get those slippers and after a while they loose their cushion. Slippers at Victoria Secret have a great feel and last longer than you can imagine allowing for you to never wear out the cushion. 6. Sweaters. Sweaters can be all over but for a great quality try Target and Old Navy, American Eagle, and Express. 7. Knee High Socks & Tights. These both can be found for $6-8 at Target in the tights and stocking section. These are warm and are very durable. You can pair the knee high scoks off with your booties from Jessica Simpson booties or with the tights. Rather than investing in yet another coat or jacket, and particularly for those really cold days which take you by surprise with their bitter chill, one great way to achieve added warmth is by wearing a stunning silk scarf or shawl over the top of your existing outer wear. If silk does not at first strike you as a particularly practical fabric for cold, wintry days, then just bear in mind that it has been used for many years for its wonderful insulating properties. Even the aviators of yesteryear who had to face the extreme cold up in the air in their cockpits were protected by aviator jackets lined with this very material. Today you will find many items of clothing and accessories, such as jackets and gloves, which also use it for lining. A women’s silk scarf or shawl worn over a coat or jacket does not just provide added warmth, however. It adds a look of sheer elegance and glamour and gives the item of clothing a complete facelift. Hand painted scarves and handmade shawls in particular make a stunning statement and the eye-catching designs are certain to turn heads. 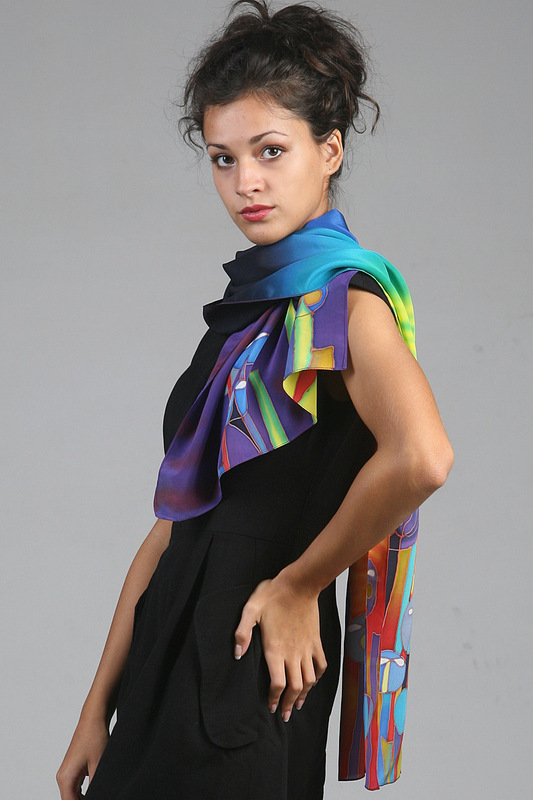 Hand painted scarves and shawls really do stand out from the printed alternatives in all kinds of ways. The silk used in their production is 100% pure and so the fabric moves and drapes in a way which poorer quality silk or manmade fabrics simply cannot emulate. Every design is totally unique too, which means that your look is as individual as you are and you never have to face the embarrassment of bumping into someone who is wearing the exact same thing as you. The colors on hand painted silk scarves and shawls though, are probably one of the most noticeable things about them, as they have their own special vibrancy which is not apparent in the printed items. Because the dyes are absorbed into the material during the hand painting process, they do not affect the feel of the silk either, so it remains beautifully soft. Whether you choose bright, bold colors to chase away the winter blues or soft pastels to flatter your coloring and your outfit, you don’t have to worry that a few drops of rain will cause the dyes to run. The hand-making process ensures that the colors are fixed so that they will not leach if you happen to get caught in a shower or when you hand wash your fabulous accessory. Why should we pay 6 times more price for famous scarves brands like? I can offer for You, something even more unique and beautiful! 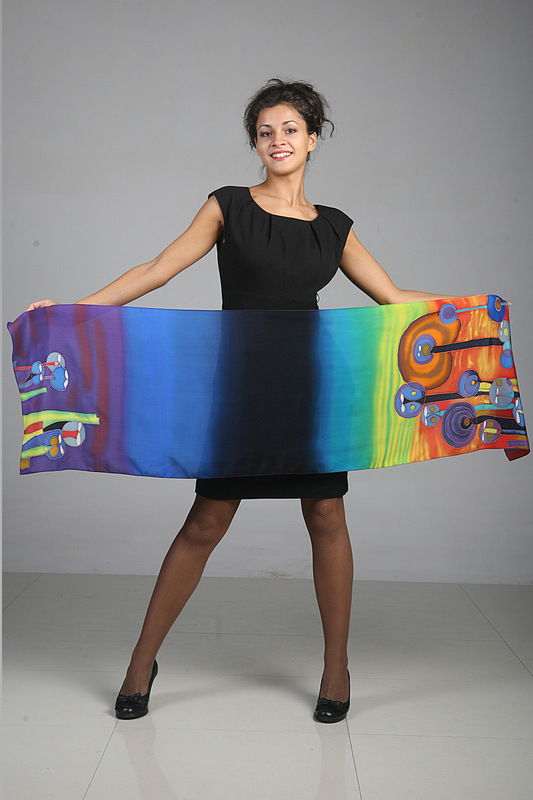 You will definitely snare your share of attention with this spectacularly beautiful hand painted chiffon scarf. 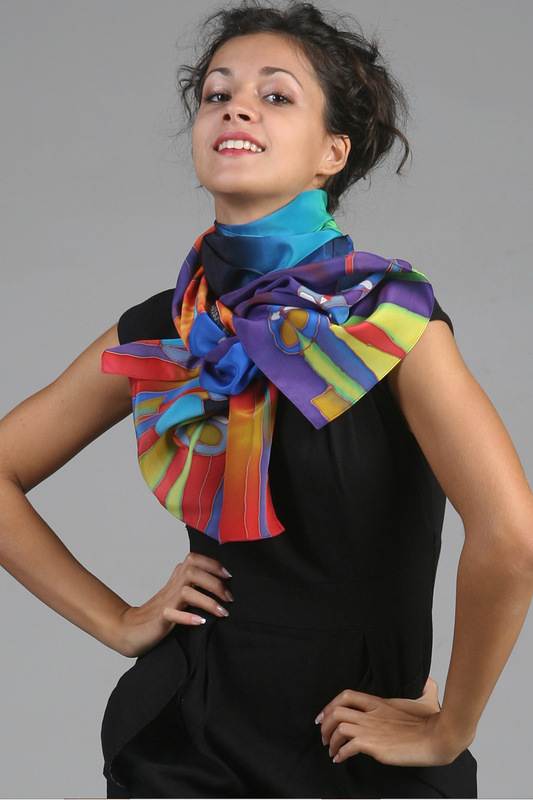 You will love this gorgeous crepe silk designer scarf! It is the perfect scarf to accent your outfit with. Exclusively ours online. No place in the world sells it!